The big news in the NBA was Jimmy Butler’s return to practice with his team, the Minnesota Timberwolves. Butler asked for a trade three weeks ago and has made it clear he’s not happy (apparently the team didn’t previously use their cap space to make a deal with him). At practice on Wednesday, Butler showed his frustration with the team and yelled to their GM Scott Layden, “You f—ing need me, Scott. You can’t win without me.” The Miami Heat remain interested in talks to acquire Butler. 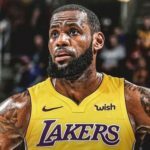 In a meaningless pre-season game between the Los Angeles Lakers and the Golden State Warriors, new Laker LeBron James added some much-anticipated star power and excitement. LeBron lit up the arena with 15 points and 10 rebounds in 18 minutes of play, including a buzzer beater three-pointer before halftime. It was also the Lakers’ Lonzo Ball’s first game coming back from knee injury, and after a slow start, wow’d the crowd with a perfectly timed alley-oop from LeBron. The NFL announced they’ve had significantly fewer arrests of their players over the last four years. According to the league, they’ve cracked down on punishments for domestic abuse and instituted services for the prevention of drunk driving. For example, the league partnered with Lyft car service allowing active players to receive $250 in credits.